KoopaTV: Nintendo Switch Amazon Prices, and Prime Day 2017! Nintendo Switch Amazon Prices, and Prime Day 2017! By LUDWIG VON KOOPA - Check back daily for another set of prices. Well then. Yesterday's article had quite the sequel hook: Today I would reveal how I got a Nintendo Switch! Well, I purchased it from Amazon, an all-around great company. KoopaTV gives away Amazon gift card codes twice every year for the KoopaTV Loyalty Rewards Program (and other prizes for the other months of the year, so be engaged all the time! ), since you can get pretty much everything off Amazon. But if you look today at the Amazon-instituted holiday, Prime Day, you won't find Nintendo Switch deals. In fact, you won't really find any in stock. The Nintendo Switch continues to be very elusive unless you are one of the lucky people who happen to look as Amazon gets a few more Nintendo Switch units in stock. I happened to be one of those lucky ones. 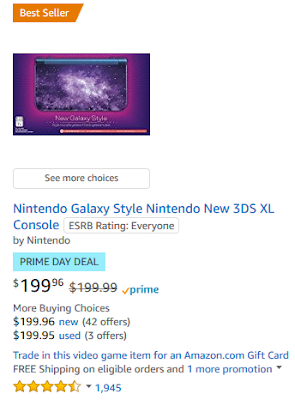 PRIME DAY DEAL: Save three cents on a New Nintendo 3DS XL, Galaxy style! You can get a lot of gaming headsets for a lot of money off, if you're into those. You can also get a lot of savings on some competitor console manufacturer products... or wait for Black Friday and/or Cyber Monday. That's in only four months, anyway, and there will be new products out by then anyway. It's a daily chart of Nintendo Switch pricing fluctuations on Amazon! Of course, they fluctuate... constantly — a lot more often than daily. So these are the prices for whenever I look that day, which... have mostly been the mornings (pre-noon) of that day. The important take-away is that the Nintendo Switch with the Neon Blue and Neon Red Joy-Con are almost always more expensive than the Nintendo Switch with the Grey Joy-Con. I suppose that means the demand for the colourful ones (coloured purple in my chart because that's what red and blue put together are) is slightly higher than grey. The price fluctuations are all presumably a reflection of constant supply and demand changes. Economics! I'm sure you can guess from the chart what day I ordered my Nintendo Switch. It was only available for around an hour or so at the $300 MSRP, and then shot back up $120 above MSRP. I guess I'm lucky. But... you can be, too. Keep at it! When I started the chart on July 3rd, I sure didn't expect the price-tracking to uncover a normally-priced Switch that very week! I thought this would be a very long, ongoing thing. I hope that dip inspires you, and I hope, if you return to this article many days or weeks or months post-publishing, there will be more such dips and an overall lowering of prices. By the way: Amazon shipped the Switch to me a day early, out of a two day shipping timeline. Whenever Ludwig stops updating the chart, this article will have an update about it in this very footer. In the meantime, share your Amazon Prime Day deal stories, if you got any, or Nintendo Switch deals. It's unclear which will be more rare. Prime Day 2016 wasn't all that good, either. Prime Day 2018 wasn't all that good, either. Amazon shipped Super Smash Bros. For Wii U more than a week early. The Nintendo Switch has its supply issues in control now! Sweet deal! I thought you would have had to pay out the nose to get one off of Amazon! Do you have a list of games in your head that you hope they'll release on the Switch? I have a few, and I'll transfer them from my head straight to the screen, via keyboarding magic. Animal Crossing would be nice, and it probably would have stuck another little jab at the other systems during E3. The switch is hands down perfect for Animal Crossing, a huge town with all the online functions of City Folk, with the on the go features of New Leaf. Notice how I've said nothing about Monster Hunter yet? A new and awesome Pilotwings, Mario Maker 2, and last but not least!... WWE 28-ooops! Nevermind, I guess they just decided to do that. Well... heck. This is awkward. Hum. I'm actually relieved that the newest installment of Monster Hunter isn't going to muck up the switch, don't get me wrong, I really did like Monster Hunter 4 Ultimate, but the community that those series of games breeds, along with the continuous drop in difficulty and overall charm that the series has gone through with Generations and that weird monster hunter babies thing in Japan, well, I'm just glad that I won't be tempted to buy it because my friends have, just so that it can get dusty on a shelf while I'm playing Splatoon 2, Mk8D, Breath of the Wild, Mario Odyssey, and even Metroid 2 on the 3DS. That's sixty some dollars that will more gladly go to some Hat tossin' wedding crasher~! You got a list too? Would you be disappointed if I answered “No.” to the wishlist question? 'cause... that's, uh, the case. No More Heroes (sequel?) will be on the Switch and that's wot I wanted the most. Remember I told you about the Gamestop bundle which is how I got the Switch? I managed to return the headphones after all. I kept the strategy guide though. It looks really nice. I'm disappointed that Breath of the Wild's case is literally just a removable cover, and when you open it, it's just the card with literally no other documentation in there. Not even the black-and-white seizure warning mini-pamphlet.